The Canon EF 24-105mm f/3.5-5.6 IS STM Lens is an economically-built, value-priced, full frame compatible zoom lens that covers the most frequently used focal lengths. This lens offers excellently-performing image stabilization along with smooth and very quiet autofocus in a light and modestly-sized package. The 24-105 STM's image quality (especially at narrower apertures) is quite good. Though this lens is not available in a DSLR kit as of review time, it is similar to the STM kit lenses available with video-capable EOS APS-C DSLRs in very many regards. When the 24-105 STM lens first became available, Canon had exactly one full frame compatible, non-L zoom lens with a focal length wider than 70mm. That lens was the 16 year old Canon EF 28-135mm f/3.5-5.6 IS USM Lens. While the 28-135 IS has long been bargain-priced, that lens' IS system is one of the earliest and while 135mm on the long end is very nice, 28mm often does not seem wide enough. General purpose zoom lenses are often the most-used lenses in a camera kit, and with a focal length range and other features ideal for general purpose use, I clearly see room for the lower-end, value-based EF 24-105mm f/3.5-5.6 IS STM Lens in Canon's lineup. When choosing a lens, start first with your focal length needs. The focal length range determines the angle of view range you will have to work with and the angle of view range determines the combinations of perspective and subject framing you can achieve. The 24-105mm range contains a superset of the range I am looking for in my general purpose lens and a superset in this case is an asset. There are a limitless number of uses for a 24-105mm focal length range and I will not do justice to that list, but I will provide some ideas. Use the wide end to frame your environmental portraits or groups in tight spaces. Use the mid-range focal lengths to frame your full and half body portraits as well as group photos. Zoom to 105mm for a moderately-tight head shot that retains decent perspective, step back for great head and shoulders perspective or move farther away to capture less-tightly-framed portraits while remaining covert. The entire focal length range works very well for landscape photography and as I'll discuss later, the image quality this lens delivers at the narrow apertures needed to keep an entire landscape scene in focus is quite good and image stabilization means you may be able to forgo the tripod if necessary. Need pictures of medium-small through very large items you are selling? This lens can handle your cell phone, your car and even your house. Many still life subjects are ideally captured by this range. Do you travel anywhere? These are focal lengths you want to have with you. Here are two examples of what this focal length range looks like on a full frame Canon EOS 5D Mark III DSLR camera. Mount this lens on an ASP-C/1.6x FOVCF sensor format DSLR and the angle of view is similar to a 38.4-168mm lens on a full frame body. Obviously, these are narrower angles of view and the uses for this lens shift away from wide angle and deeper into the telephoto range on APS-C format. The list of APS-C subjects remains similar, but the portrait range is even better covered and landscape photographers will likely also-want an ultra-wide angle lens in their 24-105 STM kits. To keep lenses value-priced, narrower max apertures are typically used. And also typical is that the max apertures become narrower as the focal length increases. Variable max-aperture lenses are not my favorite (wide open exposures change as the focal length is increased), but I understand the benefits/economy of providing the widest aperture available at all focal lengths of a compact, inexpensive lens design. Yes, at the wide end, this lens has a 1/3 stop wider aperture than Canon's pro-grade f/4L zooms, but ... that advantage is erased 4mm later (at 28mm) and the f/4L lenses gain the aperture advantage at 42mm. At 67mm and longer, the f/4L lenses have a 1 stop advantage. At the referenced f/4 vs f/5.6 aperture comparison, the mentioned L zooms can stop action in 1/2 as much light and can create a stronger background blur. 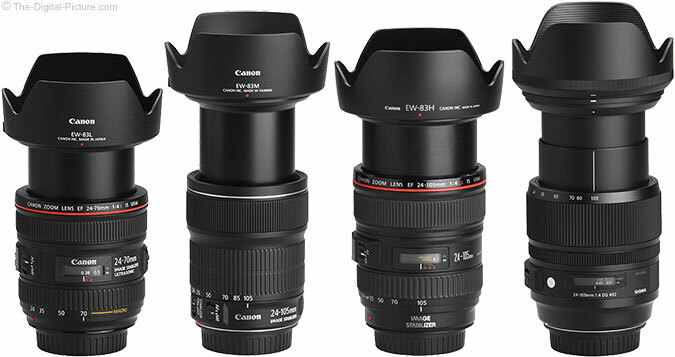 Obviously excluded from the above table are Canon's fixed max-aperture lenses including the 24-70 f/2.8L II, 24-70 f/4L and 24-105 f/4L IS. 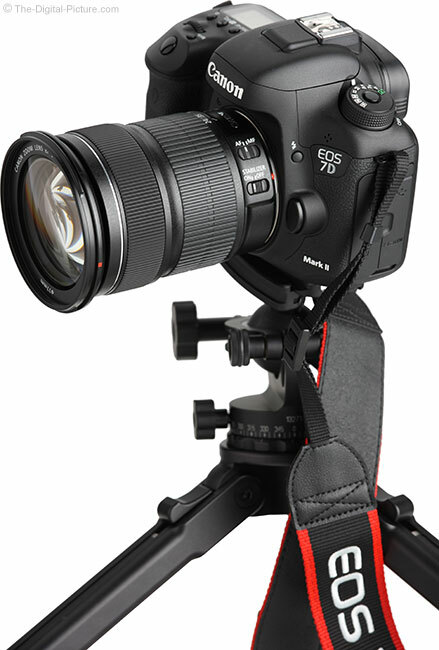 Greatly aiding a narrow max-aperture lens is image stabilization (IS). IS is a feature that I love and the 24-105 STM has it. Canon rates this IS implementation at a best-available at review time 4 stops. Shown above are 100% crops from images captured with an EOS 5D III at the stated shutter speed and focal length. These crops are from RAW images processed in DPP using the Standard Picture Style with sharpness set to "2" (low on the 0-10 scale). Both images are at exposures approximately 6 stops longer than typically required for sharp images or the equivalent of 1/64 as much light. IS has been around for a long time (the EF 28-135 IS has had it for 16 years), but I'm still amazed at what this technology can do. IS is not always the answer. There are times when image stabilization does not work so well, such as when the subject is in motion, but the versatility added to a lens by the IS feature has a lot of value. As with the other image stabilized STM lenses that have come before it, the 24-105 STM's IS system is very stable and smooth. Canon informed me that this lens does not have the "dynamic IS" implementation (expanded IS range when walking), but the image is very stable even while actively moving the camera including while video recording. It is also nearly silent. Hearing any symptom of IS functioning requires an ear placed nearly against the lens and audio recorded with the camera's built-in mic is not influenced by IS sound. IS smoothness and quietness contribute to this lens' excellent video capabilities. As always with in-lens IS, the photographer sees a stabilized viewfinder (or LCD). 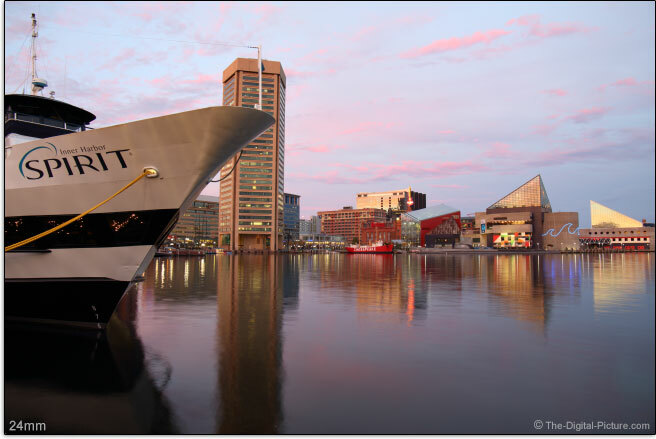 This makes subject framing easier and makes your photography a more pleasant experience. 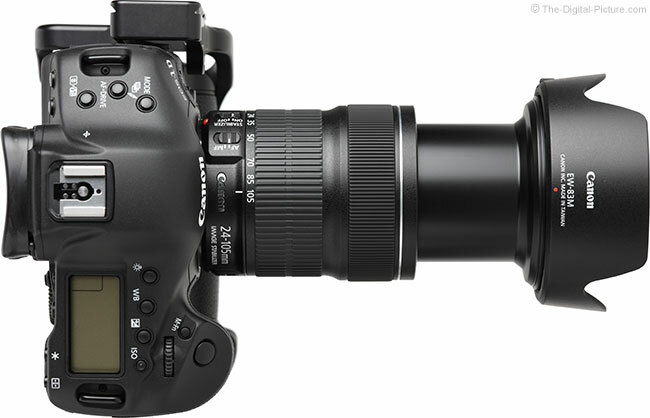 The 24-105 STM features auto-panning (a switch setting is not required for the lens to stabilize in one direction only) and auto tripod detection (IS may remain switched on during tripod use). 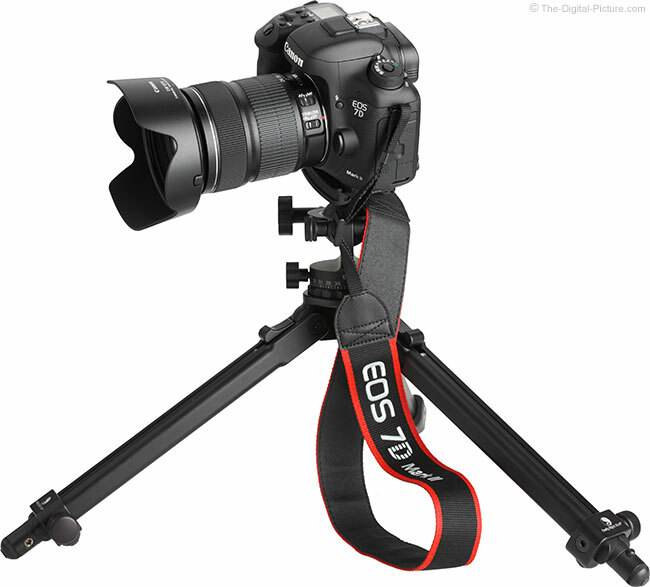 Note that Canon recommends turning IS off when using a tripod (to conserve a small amount battery life) and they recommend leaving IS on when using a monopod (to assist in stabilizing the image). The first hint of a Canon lens' image quality usually accompanies the lens announcement in the form of theoretical MTF charts. Here are the MTF charts for the Canon EF 24-105mm f/3.5-5.6 IS STM Lens along with comparison charts from the Canon EF 24-105mm f/4L IS USM Lens, possibly my most-ever-used lens. The thick lines show contrast while the thin lines show resolution. The solid lines show sagittal (lines radiating from center to outer image circle) results while the dashed lines show meridional (lines perpendicular to the sagittal lines) results. The black lines indicate a wide open aperture while the blue lines show results at f/8. The left side of the chart shows center-of-the-image-circle measurement and the right side shows peripheral measurement. The higher the lines, the better the lens performs. The difference in list price between the two above-compared lenses does not appear to be reflected in the MTF charts. Waiting for the lens to arrive is the next step and with lens in hand, the real answers become available. With a wide open aperture, the 24-105 STM lens' center of the frame image quality slowly transitions from very sharp to modestly soft as the zoom range is traversed from 24mm through 105mm. At 24mm, stopping down yields only little or no noticeable difference in center-of-the-frame image quality (and little improvement is needed). Using 35mm at a wide open f/4 aperture results in very good center sharpness with light improvement seen at f/5.6. By 50mm, the image sharpness difference/contrast increase made by an f/4.5 to f/5.6 aperture change is noticeable. Expect the same improvement by using a one stop narrower than wide open aperture from 50mm through 105mm. As is often the case, the 24-105 STM's corner image quality trails its center of the frame image quality. The corners are never terrible (complete mush), but in general, using a wide open aperture results in mildly soft corners from this lens. Corner image quality steadily improves as the aperture narrows through f/11 where corners have excellent image quality for a zoom lens. Complicating matters is that, as a generalization for this review lens copy in particular, the bottom corners of the frame slightly trail the top corners in sharpness until they also come into sharp focus at f/11. Overall and comparatively speaking, this lens performs nicely from an image sharpness perspective. As a rule, especially good results are obtained by stopping down at least one stop. Of course, by 67mm, f/5.6 is wide open and from 67mm through 105mm, f/8 is the aperture needed to see the nice sharpness/contrast improvement and f/8 is a rather narrow aperture. Results at f/11 are excellent, though diffraction will visibly impact sharpness on the 18mp and higher resolution APS-C bodies. APS-C bodies will be far less affected by any corner image quality deficiencies. Noticeably impacting 105mm full frame corner image sharpness is CA (Chromatic Aberration). Typical for a lower-priced general purpose zoom lens is that CA is present and it is most easily seen at the extents of the focal length range. At 24mm, CA can be found deep into the frame with a modest amount showing in corners. Very little CA shows at 35mm and then increases in visibility to minor at 50mm, moderate at 70mm, moderately strong at 85mm an rather strong and deep-reaching by 105mm. 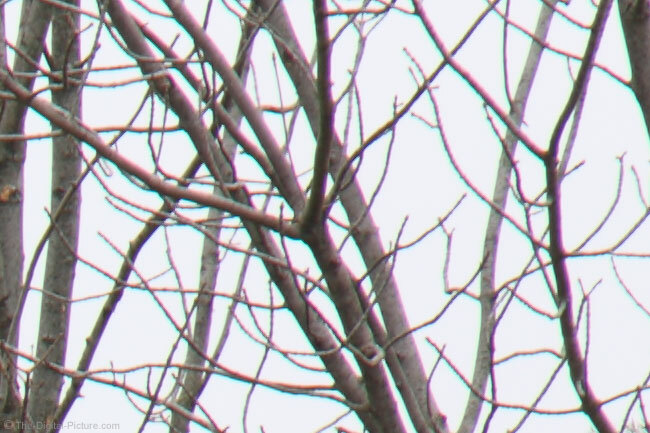 The above photo shows a 100% crop from the top right corner of a 105mm f/11 frame, showing maximum CA. The magenta and cyan colors are not part of this scene. These colors show that different wavelengths of light are not being identically focused on the sensor. Also impacting corner image quality is vignetting/peripheral shading. Vignetting is normal and also normal is for the strongest shading to be in the widest angle corners with a wide open aperture. The 24-105 STM upholds normal with about 3.5 stops of shading at 24mm and with an f/3.5 aperture. Corner shading decreases from a just-noticeable 1.4 stops in 35mm corners until a generally not noticeable .7 stops show in wide open 85mm corners. Vignetting increases very slightly again at 105mm to a not usually noticed .9 stops max. Stopping down the aperture 1 stop eliminates noticeable vignetting with 24mm being an exception. Corners at 24mm f/5.6 show a still-noticeable 2 stops of shading and a just-noticeable over 1 stop of shading remains even at f/11. All that said, this lens performs well in this regard. As usual, APS-C/1.6x format DSLR owners do not need to worry about vignetting from this lens. The shading is primarily outside of the smaller image circle used by these cameras. While this lens is not completely flare-free, it produces nice results even with bright lights (including the sun) in the corner of the frame. As a rule, zoom lenses covering the standard/normal focal lengths have barrel distortion at the wide end and pincushion distortion at the long end. Varying is the amount of distortion and where the transition between the two types occurs. In this lens, there is a moderate amount of barrel distortion that appears as a bulge in the middle of the frame at 24mm. Somewhat unusual is how quickly the distortion changes over to the pincushion type – at only a few mm beyond 24mm. The amount of pincushion distortion is somewhat varied over the balance (most) of the focal length range, but I'll call it moderate. With relatively narrow apertures and a focal length range that goes only slightly into the telephoto range, this is not the lens to pick if creating diffusely-blurred backgrounds is a primary goal. While this lens can create a blurred background (especially at 105mm with a very close subject and a distant background), the quality of the background blur (bokeh) is not a big strength either. Here is a 70mm comparison between the Canon EF 24-105mm IS STM Lens and the Canon EF 24-70mm f/4L IS USM Lens showing the difference in smoothness of the out of focus highlights. At 70mm, the 24-105 STM's rounded 7-blade aperture is narrow to start with and at one stop narrower than wide open (f/8), creates nicely-rounded out of focus specular highlights. But, the round circles are not nearly as evenly filled as those from the 24-70 f/4L IS results shown in this comparison. That this lens has an odd number of aperture blades (vs. an even number) is a positive attribute. Even numbers of aperture blades create stars with the same number of points as there are blades from points of light in the frame (such as street lights and Christmas tree lights). An odd number of aperture blades will create stars with twice as many points as there are blades. My preference is usually for the latter. In the example above, thanks to the 7 blade design, you see 14 point stars around the harbor street lights. 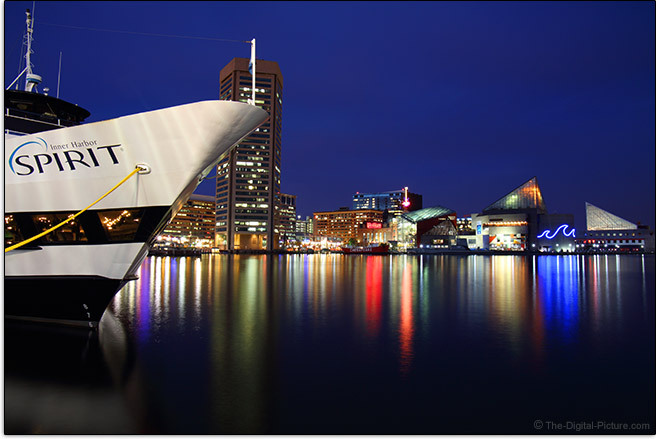 As usual, I have spent a good amount of time with this lens and have had it to locations including Baltimore, Maryland. I spent much of a day driving to/from this location and setting up for this image. I am very pleased with the outcome and have no regrets from using this lens for the capture. Even at full resolution, this image has high quality. The "STM" in the lens name refers to a stepping motor-driven AF implementation. Canon's latest lenses come with either Ring USM-driven AF (very fast and relatively quiet) or the STM design. STM AF advantages are (usually) nearly silent operation and very smooth focus distance changes. These advantages are especially helpful for video recording using Movie Servo AF. This is Canon's 8th STM lens, but only the second full frame compatible STM lens (the Canon EF 40mm f/2.8 STM Lens was the first). According to Canon, this is the first full frame lens to incorporate a "lead screw-type stepping motor." While this lens can easily be used on an APS-C body, there are no full frame DSLR cameras that can make use of this lens' Movie Servo AF advantages as of review time. While Canon does not actively promote the AF speed of the STM lenses, this lens is not a slow focuser. If you ask auto focus to make a full extents focus distance change, you are not going to be greatly impressed by the speed in which the lens responds. But, if your focus distance changes are relatively small (which is more typical in real use), the lens gets the job done with nice speed. Most important is that this lens focuses very accurately. The manual focus ring, in all STM designs to date, electronically controls the focus of the lens (it is not a direct drive system). The focusing ring does not turn during AF and FTM (Full Time Manual) focusing is supported. 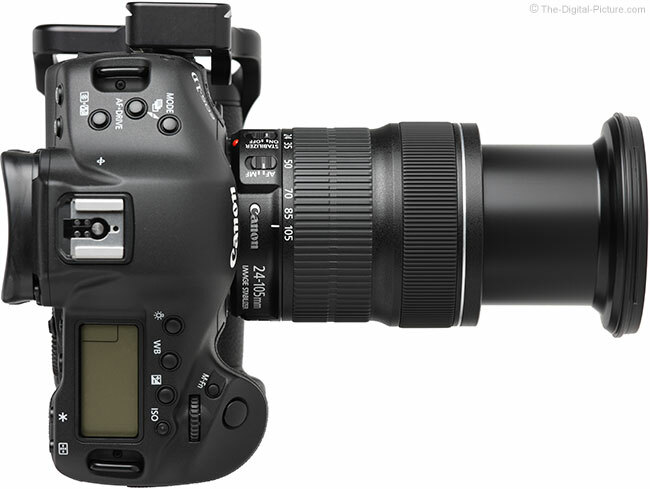 In AF mode, manual focusing is supported only while the shutter release is half-pressed. 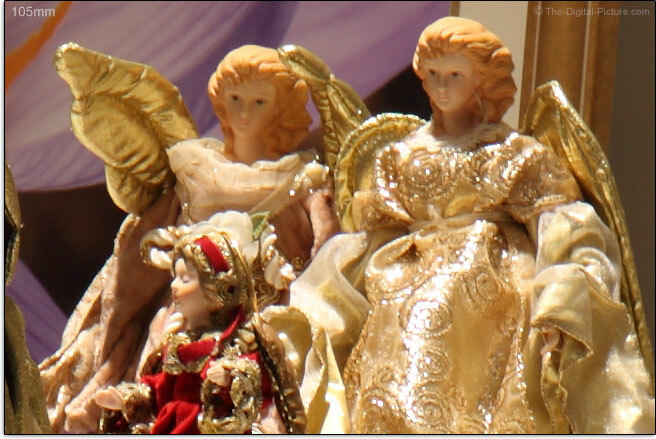 Note that FTM does not work if electronic manual focusing is disabled in the camera's menu (if this option is present). 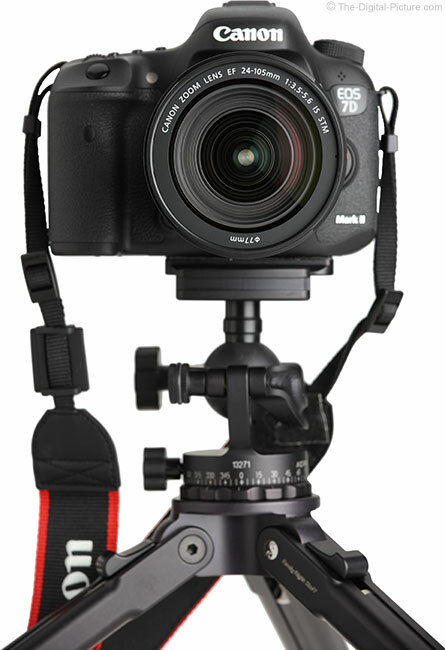 The lens' switch must be in the "MF" position and the camera meter must be on/awake for manual focusing to be available. Also normal for STM lenses is that the lens goes through an initialization process during power-up that involves the lens racking focus by some amount in both directions. This process caused me grief when I had carefully setup a shot, waited for the right timing, woke up the camera and watched my scene go out of focus. But, the focus change was only temporary. I soon determined that the focus was returning to my previously set distance and I no longer stress at the initialization process. The 24-105 STMs focus ring is nicely-sized and positioned ideally (forward of the zoom ring). The focus ring has good smoothness and the 105° of full-extent rotation is adequate for fine tuning focus even at 105mm at very close focus distances. This is a rear-focusing AF system. The lens does not extend with focusing and the front filter threads do not rotate. Expect some modest subject size change in the frame when pulling focus using this lens. There are no focus distance or DOF markings provided on this lens. Canon launched the EF 24-105mm f/3.5-5.6 IS STM Lens alongside the EOS 7D Mark II, featuring Dual Pixel CMOS AF and Movie Servo AF. 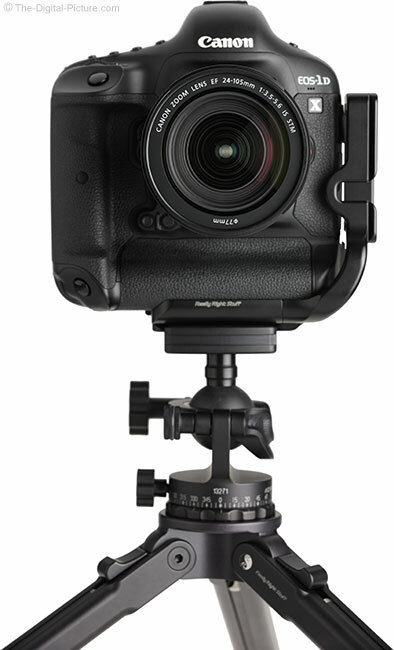 Movie Servo AF makes recording video very easy and the STM lenses are very well-suited for this task. The smooth focusing makes focus distance transitions easy on the viewer's eyes and the sound of the lens focusing is not picked up by the camera's mic. Even the STM lens' aperture changes are quiet and smooth. As already mentioned, no full frame DSLR cameras support Movie Servo AF at this time, but ... I expect that to change. As this image was captured at 105mm with an f/5.6 aperture, the background blur shown here is about the max this lens is capable of. 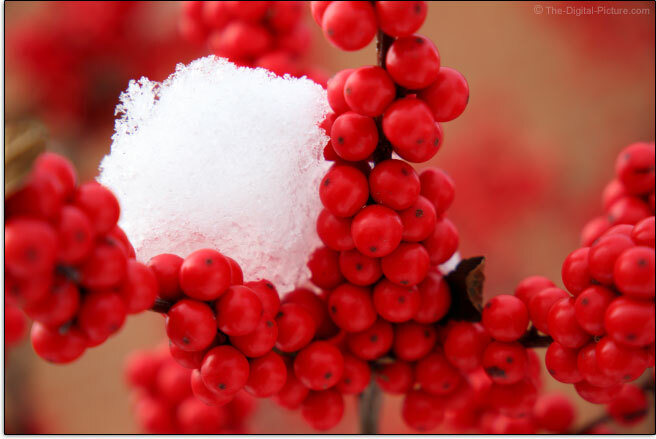 The blur in this image background is a brick church roughly 20' (6m) behind the berries. For greater MM, use extension tubes to reduce the minimum focus distance (MFD). 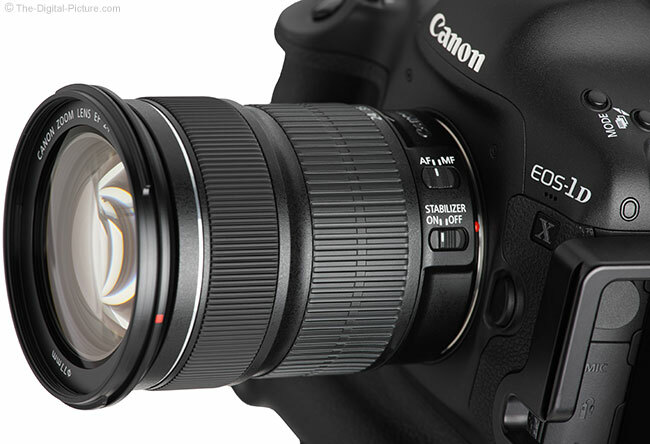 With the Canon EF 12mm Extension Tube II behind the 24-105 STM, the magnification range becomes 0.61-0.46x. That range is 0.67-0.27x with the Canon EF 25mm Extension Tube II mounted. Infinity focus is not available when extension tubes are mounted. 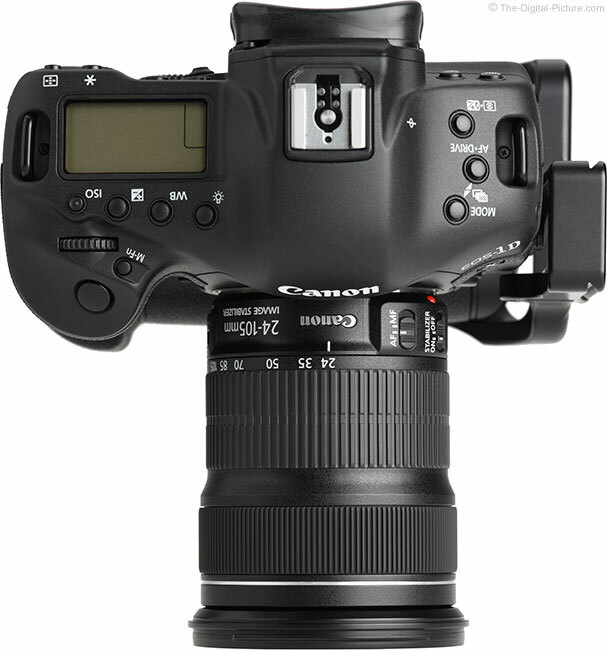 Another option for increasing magnification with this lens is the Canon 500D Close-up Lens. This lens mounts via the filter threads and provides a 0.41-0.21x range of magnifications. Again, infinity focus is not available with the 500D mounted. The Canon EF 24-105mm f/3.5-5.6 IS STM Lens has an average build quality that is most similar to the EF-S 18-135mm IS STM lens. Following are these lenses shown side-by-side. The primary lens barrel construction material is quality plastic with zoom and focus rings covered with a rubberized, ribbed grip surface. The overall shape of the lens is mostly smooth with a small diameter increase at the focus ring area and another slightly more significant increase at the end of the extending inner lens barrel. The area forward of the flush-mount switches is all zoom ring until immediately adjacent to the manual focus ring. The zoom ring includes portion of the lens between the ribbed areas of the zoom and focus rings. Like all of the other zoom lenses with a similar focal length range, this lens extends with focal length increase (up to 1.92"/48.7mm). A lock switch is provided to lock the lens in the retracted position and prevent gravity zooming (if it ever becomes an issue). The rings are reasonable smooth with a proper rotation force required. Expect some play in inner/extending lens barrel, but none in the zoom and focus rings. This is not a weather-sealed lens. The 24-105 STM utilizes relatively large but very common 77mm-sized filters. I am seeing a small amount of additional vignetting caused by a standard thickness circular polarizer filter used at 24mm. To avoid this shading, use a slim filter model such as the B+W XS-Pro for this lens. Canon, at review time, does not include lens hoods with most of its non-L and non-DO lenses. 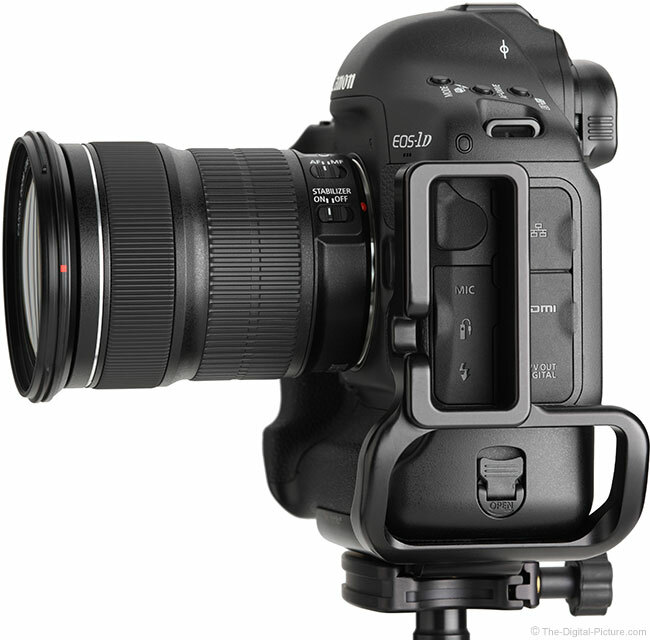 The EW-83M is the optional compatible hood for this lens. Like most of Canon's recently introduced lens hoods, the EW-83M has a lock button that makes installation and removal easy (vs. the earlier friction-fit models). Unlike most of Canon's lens hoods, the EW-83M interior is not flocked – it is just plastic. While I don't mind the plastic interior (and much prefer cleaning these), the price being asked for this hood seems a bit excessive to me. Still, the modestly-sized hood is protective to both the lens physically and to the image quality from the lens. Also not included in the 24-105 STM's box is a case. A case for storing and transporting the lens will not be hard to find. If fancy packing is your thing, the bubble wrap bag housing this lens inside the normal-appearing outer Canon lens box is not going to wow you. I'm personally less concerned about the packaging design as long as the lens arrives safely. On the surface, the 24-105 STM lens has a moderate price that seems reasonable to me. By the time you read this, all may be changed (price reductions, rebates and especially inclusion in DSLR kits), but when I compare this lens to some alternatives right now, I begin to question its current value. I'll explain. Without any rebates in place, the 24-105mm STM lens costs moderately more than the EF 28-135 IS, significantly less than the EF 24-70mm f/4L IS and even more significantly less than the EF 24-105mm f/4L IS. Canon USA rebates, if available, can greatly skew the price comparison. At this time, deep in the Christmas shopping season, two of the three competing lenses I mentioned have very significant rebates available. These rebates mean that the 28-135 IS is currently selling for 1/2 the price of the 24-105 STM. If someone is on a tight budget, they are going to choose the 28-135 option. At this time, the rebated 24-70 f/4L IS is only moderately more expensive than the STM. Someone looking for a quality lens is likely to spend the additional amount for the pro-grade L lens. However, really compounding the price issue is the 24-105 f/4L IS being commonly available in white box (removed from a DSLR kit), refurbished condition (like new) or brand new in an EOS DSLR kit for the same or just slightly higher price than the initial 24-105 STM street price. Again, most are going to choose the L lens and that is my recommendation if these options are available to you. 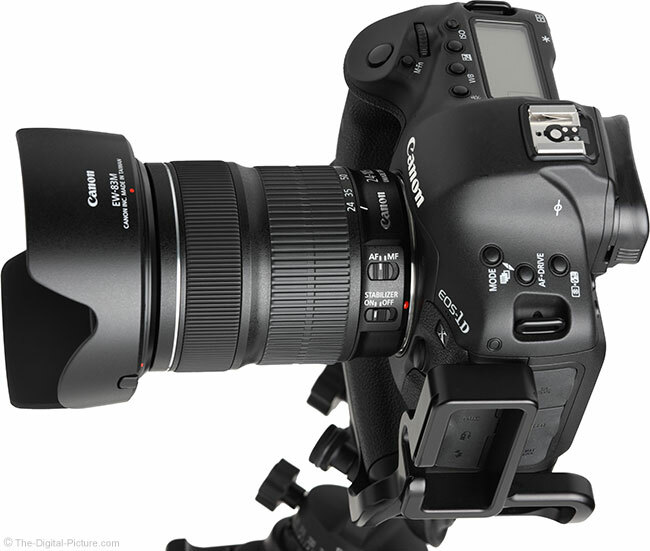 Another lens that should be considered is the Sigma 24-105mm f/4.0 DG OS HSM Art Lens. This lens is normally priced considerably higher than the 24-105 STM, but still noticeably less than the 24-70 f/4L IS lens at its current regular price. The 24-105 STM's biggest advantage over all of the other lenses being discussed here is the STM AF system when video recording in Movie Servo AF mode. None of the other lenses can focus nearly as quietly and smoothly during video recording and none of them support the full Movie Servo feature set. The Canon lenses have Ring USM AF and the Sigma has HSM. These AF systems are generally faster than STM and the directly-driven full time manual focus system is always available (and my preference to use). The non-STM lenses also have a fixed max aperture over the entire focal length range to their advantage. Being a 16 year newer design, I would rather use the 24-105 STM over the 28-135 IS. From an image quality perspective, the 24-105 STM is the better performer. The 28-135 is a much more flare-prone lens and has more vignetting. The 24-105 STM has the wide angle focal length advantage (my preference) and the 28-135 IS has the telephoto advantage. Overall, I'd take the STM, but ... that 28-135 is so much more wallet-friendly today. 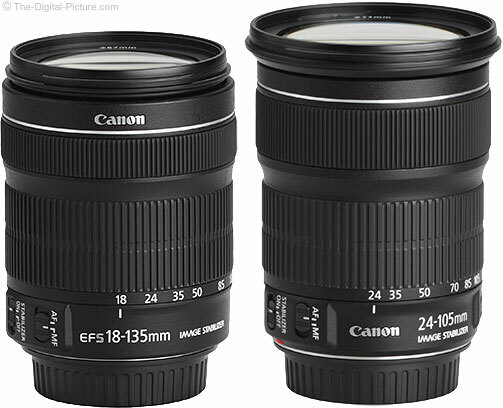 The two Canon f/4L lenses I mentioned are a solid step above the 24-105 STM in many regards. Though the difference is not dramatic, I prefer the image quality of the L lenses and their designed-for-professional-use-build (including weather-sealing) has my confidence. The STM has a focal length advantage over the 24-70 f/4L, but that Canon lens has other advantages including a significantly higher maximum magnification capability. The real bargain at this time is the 24-105 L in white box, refurbished condition or in a DSLR kit. If you are looking at normal street prices for all of these lenses, the STM option becomes much more easily justified. 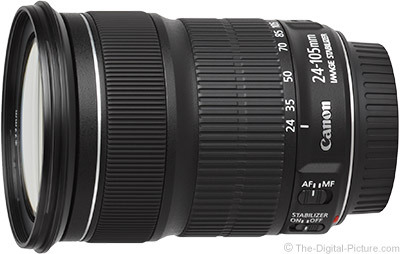 The Sigma 24-105 OS lens is a direct contender to the Canon L lenses. This lens has better image quality than the 24-105 STM and also has better build quality. There are many other lenses that could be compared to the 24-105 STM, but I'll direct you to the site's comparison tools for that purpose. The lens evaluated for this review was sourced from a retailer. The Canon EF 24-105mm f/3.5-5.6 IS STM Lens makes sense to have in Canon's lineup today, but I think that this is a lens that was introduced before its primary purpose. I think that we are going to see the 24-105 STM's role significantly increased when it shows up as a kit lens included with a DSLR – ideally a full frame model with Dual Pixel-driven Movie Servo AF that takes full advantage of the STM AF benefits. Yes, there are APS-C DSLR models that could make full use of this lens' capabilities, but ... my guess is that most people buying an inexpensive ASP-C lens are going to opt for the EF-S 18-135 STM IS that is already included in many APS-C kits (though the 24-105 STM provides an easier upgrade path to full frame). Canon Cinema EOS camera owners are another group that might consider using the 24-105 STM now as the C100 and C300 have a super 35/1.3x sensor that shows strong vignetting with EF-S lenses mounted. The 24-105 STM will become more popular after a nice price drop and another big boost will come when the 28-135 IS is no longer an alternative due to it being discontinued (I'm guessing that it will be discontinued by fading away in the not-too-distant future). 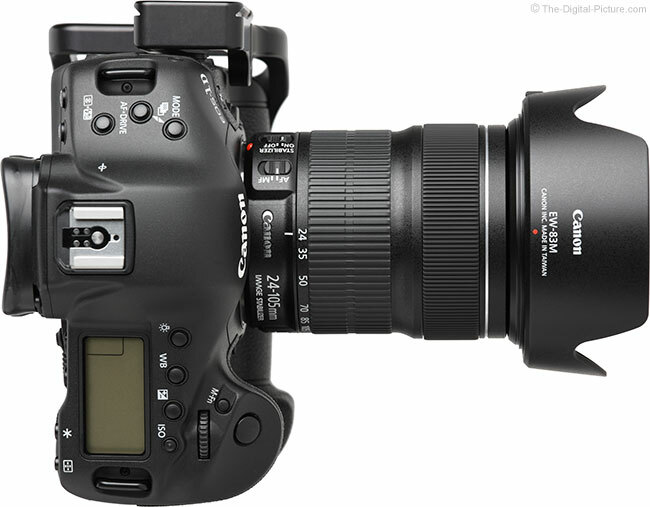 As it stands, the Canon EF 24-105mm f/3.5-5.6 IS STM Lens is a nice lens overall. The size and weight of this lens are easy to handle for long periods of time and the lens shape is comfortable to use. For a moderate price, the 24-105 STM covers the full frame image circle with very good image quality. The modern STM AF system gets the job done nicely and the image stabilization system makes sure that camera motion blur is not detracting from that image quality. This is a good value lens. 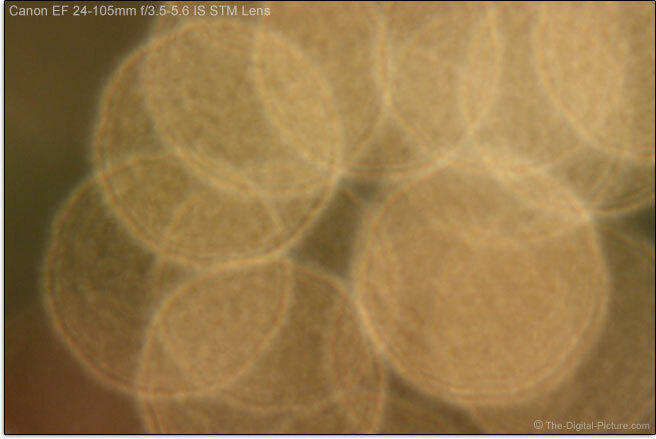 I think that we will see a lot of 24-105 IS STM lenses serving general purpose needs in the future. Update: Canon wasted no time boxing this lens up with a DSLR. Less than three weeks after completion of this review, Canon USA announced that the Canon EOS 6D would be available in a kit with EF 24-105mm IS STM Lens. While the 6D does not support DPAF, this great-value DSLR is otherwise the ideal complement to this lens. As expected, the 24-105mm STM lens is a much better value when purchased in this kit.